Peace Corps Online: 2009.02.04: February 4, 2009: Headlines: Figures: COS - Dominican Republic: Space: Education: University of Arizona News : By the time Joseph M. Acaba completed his master's degree in geology from The University of Arizona in 1992, his academic adviser and thesis director, Joseph F. Schreiber, Jr., knew that Acaba had "the right stuff." 2009.02.04: February 4, 2009: Headlines: Figures: COS - Dominican Republic: Space: Education: University of Arizona News : By the time Joseph M. Acaba completed his master's degree in geology from The University of Arizona in 1992, his academic adviser and thesis director, Joseph F. Schreiber, Jr., knew that Acaba had "the right stuff." Peace Corps Online: Directory: Dominican Republic: Special Report: RPCV Joseph Acaba: Joseph Acaba: Newest Stories: 2009.02.04: February 4, 2009: Headlines: Figures: COS - Dominican Republic: Space: Education: University of Arizona News : By the time Joseph M. Acaba completed his master's degree in geology from The University of Arizona in 1992, his academic adviser and thesis director, Joseph F. Schreiber, Jr., knew that Acaba had "the right stuff." By the time Joseph M. Acaba completed his master's degree in geology from The University of Arizona in 1992, his academic adviser and thesis director, Joseph F. Schreiber, Jr., knew that Acaba had "the right stuff." Acaba was a member of the Tucson U.S. Marine Corps Reserve Unit while a graduate student at the UA. After leaving the UA, Acaba pursued careers outside geology. "I didn't want to leave Tucson," Acaba said, "but for employment purposes, I had to." Acaba credits his diverse professional background as possibly one reason he's where he is today. After leaving Tucson, he worked for a couple of years as a hydrogeologist in Los Angeles, and from there joined the U.S. Peace Corps, working in the Dominican Republic as an environmental education volunteer. He then worked for a short time as the manager of a marine research center in the Bahamas, and eventually became a science and math teacher at a high school and middle school in central Florida. "When I was teaching, I felt it was the profession that I was really meant to do, and I really still enjoy it," Acaba said recently. "I wouldn't have left it for anything, besides becoming an astronaut." Astronaut Joseph Acaba did daring field work among granite cliffs in Cochise County. Schreiber, UA professor emeritus of geosciences, and the rest of the world will see Acaba make his first journey into space this month, one of seven astronauts aboard space shuttle Discovery for the mission designated STS-119. Shuttle Discovery and its crew are readying for launch from NASA's Kennedy Space Center in Florida as early as Feb. 19. The launch had been scheduled for Feb. 12 but NASA felayed it to no earlier than Feb. 19 while it runs tests to determine whether newly installed valves would cause serious damage if they broke during liftoff. The mission will deliver to the International Space Station the final set of solar arrays needed to complete the station's complement of electricity-generating solar panels, and through them support the station's expanded crew of six in 2009. The station is a massive 630,000-pound structure that has grown to a size larger than an average four-bedroom house. Acaba likened his role on the mission to "a utility player on a baseball team." He'll be flight deck mission specialist on both ascent and entry, he'll help command the shuttle's robotic arm, and he'll perform two of the mission's four space walks. "I'll be getting a little bit of everything on my first flight, so it's been just a great training period." Schreiber says he doesn't doubt that Acaba, 41, is up to the job. 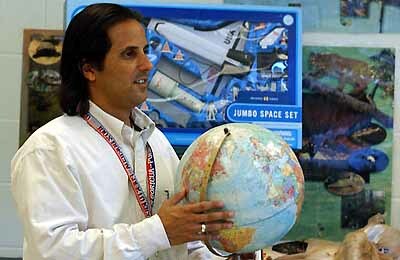 He said he wasn't surprised when Acaba was among three educators chosen in 2004 from a field of more than 1,600 qualified educators who applied for NASA's astronaut program. Acaba was born and raised in southern California. His dreams of exploring space formed early, after viewing filmstrips his father and grandfather had saved of the first Apollo lunar landing, and also from reading science fiction. 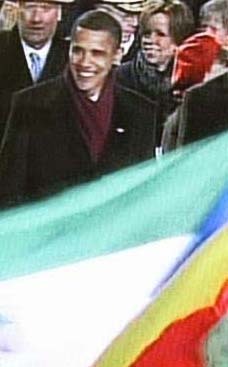 A scholarship from British Petroleum brought Acaba to the UA in 1990. Acaba said that he was initially skeptical about moving from southern California to the desert, but that Schreiber was a big reason that "for me, it was a great experience. It turned out to be a great place to be a geologist." Schreiber took Acaba on his first geology field trip to western Cochise County, an area of magnificent granitic rock outcrops where Acaba was soon doing field work for his thesis, "Primary Sediment Production from Granitic Rocks in Southeastern Arizona." "The desert scenery was probably a shock to him at first," Schreiber said. But Schreiber knew the choice sites for geology not visible from the interstate. "I doubt that most people driving I-10 have any idea of the spectacular landscape north and south of the highway," he said. Schreiber recalls a story that shows how enthusiastically Acaba tackled his field work. "Joe had the help of his two brothers in sampling an exposure of some 'granite wash' in a cliff near his research site, near the Apache Powder Plant facility. They managed to get a truck to the top of the cliff, fasten a line to the truck's front bumper, and then descend the cliff face while at the same time taking samples." Schreiber said that Acaba was impressively mature and well-organized, a self-starter and a rapid learner. Acaba "hit his stride academically with a straight-A average" and completed his master's degree from the geosciences department in only two years, which is record time, Schreiber said. Having full financial aid from British Petroleum Exploration helped but his gift for organizion played a role, too, Schreiber said. "His organizational abilities were frequently a topic of conversation by his teachers and thesis committee members. He adapted easily to the field work and lab routine, and with his enthusiasm and talent for organization, he turned out data rapidly. I will always remember his organizational skills to handle the bundles of data he was turning out. "I think part of this ability came naturally, but I would also give credit to his military training," Schreiber said. Acaba was a member of the Tucson U.S. Marine Corps Reserve Unit while a graduate student at the UA. After leaving the UA, Acaba pursued careers outside geology. "I didn't want to leave Tucson," Acaba said, "but for employment purposes, I had to." Acaba credits his diverse professional background as possibly one reason he's where he is today. After leaving Tucson, he worked for a couple of years as a hydrogeologist in Los Angeles, and from there joined the U.S. Peace Corps, working in the Dominican Republic as an environmental education volunteer. He then worked for a short time as the manager of a marine research center in the Bahamas, and eventually became a science and math teacher at a high school and middle school in central Florida. "When I was teaching, I felt it was the profession that I was really meant to do, and I really still enjoy it," Acaba said recently. "I wouldn't have left it for anything, besides becoming an astronaut." Honduras RPCV Jon Carson, 33, presided over thousands of workers as national field director for the Obama campaign and said the biggest challenge -- and surprise -- was the volume of volunteer help, including more than 15,000 "super volunteers," who were a big part of what made Obama's campaign so successful. PCOL endorses Jon Carson as the man who can revitalize the Peace Corps, bring it into the internet age, and meet Obama's goal of doubling the size of the Peace Corps by 2011. Peace Corps Director Ron Tschetter sat down for an in-depth interview to discuss the evacuation from Bolivia, political appointees at Peace Corps headquarters, the five year rule, the Peace Corps Foundation, the internet and the Peace Corps, how the transition is going, and what the prospects are for doubling the size of the Peace Corps by 2011. Read the interview and you are sure to learn something new about the Peace Corps. PCOL previously did an interview with Director Gaddi Vasquez. Read more stories from January 2009 and December 2008. Peace Corps has withdrawn all volunteers from Bolivia because of "growing instability" and the expulsion of US Ambassador Philip Goldberg after Bolivian President Evo Morales accused the American government of inciting violence in the country. This is not the first controversy surrounding Goldberg's tenure as US ambassador to Bolivia. Latest: Some volunteers have returned to Bolivia on their own to complete their projects. The Peace Corps has announced that all Volunteers and trainees serving in the Republic of Georgia are safe and they have been temporarily relocated to neighboring Armenia. Read the analysis by one RPCV on how Georgia's President Mikheil Saakashvili believed that he could launch a lightning assault on South Ossetia and reclaim the republic without substantial grief from Moscow and that Saakashvili's statements once the war began demonstrated that he expected real Western help in confronting Russia.